Its profusion of cheery, bright yellow flowers make black-eyed Susan one of our most beloved wildflowers. A usually annual herb, unbranched, very hairy. Flowerheads solitary or in loose, open clusters, terminal on the stalk, to 4 inches across. Ray flowers 8–21, rich yellow or orangish, slender. Disk hemispherical, becoming egg-shaped, deep brown to purple-brown. Blooms May–October. Leaves hairy, sessile except a few basal leaves, lanceolate, sometimes with fine teeth. 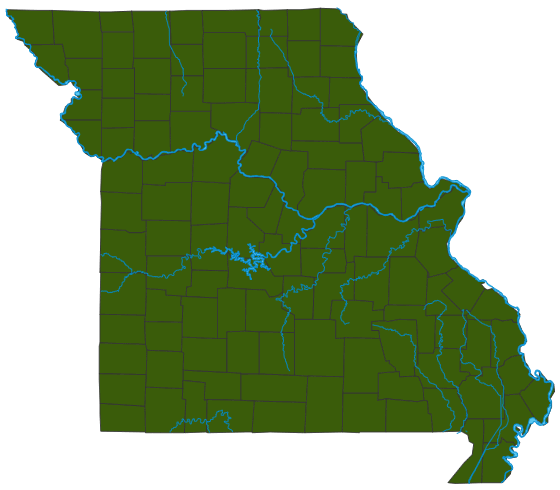 Similar species: There are 9 Rudbeckia species in Missouri. Four of the most commonly encountered are brown-eyed Susan (R. triloba, to 5 feet tall; small flowerheads to 1 inch across; leaves with coarse teeth); wild goldenglow (R. laciniata, to 9 feet tall; green disk; 6–10 yellow rays; leaves with 3–7 deeply cut lobes); Missouri black-eyed Susan (R. missouriensis, like R. hirta but smaller; very hairy; with all but lowest leaves linear); and sweet coneflower (R. subtomentosa, a hairy plant to 6 feet tall; 12–20 yellow rays per head; 3-lobed lower leaves). Black-eyed Susan is commonly planted along roadways, so when it’s blooming, May through October, you’re sure to see it somewhere. Black-eyed Susan flowerheads are solitary or in loose, open clusters, terminal on the stalk, and grow to 4 inches across. Black-eyed Susan commonly grows in pastures, old fields, railroads, roadsides, and open, disturbed areas. Black-eyed Susan and other rudbeckies display patterns in ultraviolet light that bees and some other insects can see. Black-eyed Susan is popular as a native garden ornamental and is often sold as a cut flower. Bases of bluffs, openings of moist to dry upland forests, upland prairies, and glades; also pastures, old fields, railroads, roadsides, and open, disturbed areas. This is the most abundant rudbeckia in the state and the one that prospers best in disturbed habitats. Black-eyed Susan is widely cultivated both in gardens and as a roadside-beautification flower. Several cultivars have been developed, which have, for instance, longer ray flowers or ray flowers that are reddish. In the 1970s, researchers explored the different patterns of reflected ultraviolet light in the corollas of this and other rudbeckias. Although UV light is invisible to humans, bees and some other insects can see it, and the special patterns in the flowers serve especially to attract them.